TFLTruck just posted a video from the Chicago Auto Show showing off the Mopar parts and accessories available for the 2019 Ram 1500, this is presumably what they will be showing off at their press conference tomorrow. Check it out. that Bighorn looks pretty **** good. Mopar and Ram debuted a 2019 Ram 1500 this morning at the Chicago Auto Show displaying some of the over 200 parts and accessories Mopar will sell for the all new Ram. This flame red Big Horn Sport is riding on a Mopar 2 inch lift and 35 Inch BFGoodrich KO2 tires. Black pocket style Mopar fender flares help protect the paint from the oversized tires and the hood is wearing a Mopar stripe kit. 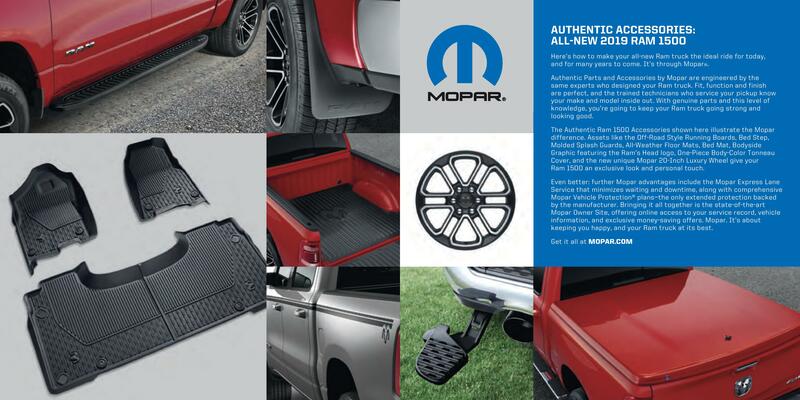 Mopar wheel to wheel running boards are also featured that tuck up tight to the body of the truck and are covered in a bedliner material. Mopar wheelsMopar 18 inch Beadlock wheelsThe Mopar accessories 18 inch beadlock wheels are identical to those that were seen on the 2016 Ram Rebel TRX Concept. Ram mopar accessoriesMopar Ram Air intake for 2019 Ram HemisUnder the hood is Mopars new Ram Airflow cold air intake that takes cold air from behind the grille into a box above the throttle body. It is definitely a different design for a cold air intake but should prove to work much better than many intakes with the filter exposed to engine bay heat. Mopar RamBlack Mopar accessories exhaust with 5 inch tipsA Mopar cat back exhaust is available in black chrome or regular chrome. This exhaust system comeswith 5 inch tips that completely fill up the exhaust cut outs in the bumper. The exhaust tips themselves are also available separately and can be bolted to the stock exhaust if you just want the look but would like to keep the stock sound. Mopar Ram RackMolar accessories “Ram Rack”The bed of the truck features the Ram Rack system inspired by the Macho Power Wagon concept. This rack system is moveable back and forth along the factory bed utility rail system. This system allows you to easily carry oversized cargo that won’t fit in the bed. Ram revealMopar Catalog, 2019 Ram 1500 accessories – FCA PhotoAlso available are Weather Tech style floor mats that snugly contour to the floor of the truck and can catch liquid spills/snow/slush etc and keep them from damaging the carpet. Katzkin leather is also available along with a ton of other accessories. Many of these Mopar accessories can be ordered at the same time as your truck allowing them to be factory installed and they will even show up on your window sticker. Check back regularly for all the latest 5th Generation Ram news and information. Don’t forget to pop into our forums section for more great content! I am liking those running boards. Noticed the drop down step too by the exhaust.Factory 2 inch lift....hmmm wonder if available on Rebel. I know the 1 inch is. Yeah that bed step looks like the AMP bedstep that's currently available in the aftermarket. They probably get AMP to make it for them. Pietro Gorlier, Head of Parts and Service (Mopar), left, and Jim Morrison, Head of the Ram Brand, introduce an outdoor-sport customized 2019 Ram 1500 at the 2018 Chicago Auto Show.Mopar offers more than 200 available custom performance and styling accessories. Pietro Gorlier, Head of Parts and Service (Mopar), FCA, showcases customized versions of the all-new Jeep® Wrangler and the 2019 Ram 1500 at the Chicago Auto Show. The Ram Truck and Mopar brands teamed up today at the Chicago Auto Show to debut an outdoor-sport-themed 2019 Ram 1500 modified with a selection of the more than 200 Mopar parts and accessories available for the all-new truck. Can't wait to see a in depth version of that catalog when it comes available. Agreed, Here is what we have seen so far. Looks good, I like the racks and exhaust. I'm usually don't like hood stripes but I think they actually look really good on this truck and kind of accentuate the lines on the hood. Great job on Mopar getting this ready for prime time. No need to wait for all weather floor mats, mud flaps, etc. Let's hope the aftermarket can quickly get a paint protection film cutout for it. I'll take the roll-up tonneau cover. I've got one on my F150 and it's great. yea will defiantly be a requirement with the painted metal bumper. Painted metal bumpers always chip and get rust spots. I have xpel on the front of my 2014 and still looks new. <woltlab-quote data-link="https://5thgenrams.com/community/forum/index.php?thread/111-customize-your-2019-ram-with-over-200-mopar-parts/&postID=446#post446" data-author="Biga">yea will defiantly be a requirement with the painted metal bumper. Painted metal bumpers always chip and get rust spots. I have xpel on the front of my 2014 and still looks new. </woltlab-quote>Me too I did my whole front end. Bumper(upper/lower), grille, hood(12 inches), fenders, A pillars, roof(12 inches), door sills. I wish I did mine when I got it, I've kept up with any rock chips etc so mine still looks good but my next truck will be done for sure. If I get a Laramie Black I might just get the whole thing done in PPF.